Reb Dovid Shmidel related that someone once asked the Chazon Ish, "How could it be that all the nations of the world stood by silently while the Germans killed millions of Jews?" The Chazon Ish replied, "Is it not an explicit Gemora in Kesubos that if the Jewish people violates the Three Oaths, Hashem will permit their flesh like the deer and the hinds of the field?" Although the official declaration of the state was made on May 14, 1948, it was preceded by six months of fighting, in which the Zionists brought the anger of the local and neighboring Arabs upon the Jews of Eretz Yisroel. Jerusalem was besieged, and the Arab villages along the western approach to Jerusalem became major battefields. In the midst of this war, on April 8, 1948, the Brisker Rav and the Chazon Ish encouraged all the religious Jews of Jerusalem to come out to the streets and wave the white flag to show the Arabs and the British that they were not Zionists and wanted no part in this war. The demonstration was led by Rabbi Yaakov Halperin, a close disciple of the Chazon Ish, and Rabbi Amram Blau, a close disciple of the Brisker Rav. 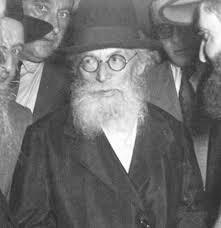 The Chazon Ish later remarked, "When the state was established, there was a kitrug (accusation) in Heaven against Jews of Eretz Yisroel for not leaving the state. I myself was ready to leave. But when they marched in Jerusalem holding white banners demanding a ceasefire, the accusation was dropped and there was atonement." When the question of founding a state was put to him by Agudah activists, he spoke against it (Mikatowitz Ad Hei B'Iyar, p. 97). He was against Agudah joining the Zionist government (ibid. p. 93). Furthermore, all versions agree that the Chazon Ish himself did not vote, for he even refused to register himself as an Israeli citizen or take out an identity card. (ibid. p. 163) This was attested to by Rabbi Refoel Halperin, Rabbi Moshe Scheinfeld, and Rabbi Kalman Cahana. With the encouragement of the Chazon Ish, the Satmar Rebbe established the only Yiddish-speaking Talmud Torah in Bnei Brak, as well as a yeshiva and beis medrash. The Chazon Ish told his talmidim to send their children to the new cheder, known as Tashbar Chazon Ish. Read about the halachic reasons not to use a lulav from land stolen from the Palestinians. Read about Israeli legislation to legalize keeping conquered land. Click here to read the words of the Chazon Ish in Lashon Hakodesh.